Clay Mohrman started playing with lighting and driftwood while he worked for an industrial light supplier in the greater Boston area. He was a hobbyist in those years, refining his craft and making one-off light sculptures for friends and family. When Clay moved to Vermont, he rented a small studio on Pine Street. He meticulously sawed, sanded, and assembled his pieces with hand tools. Despite growing interest in his light sculptures, Clay’s time-consuming, labor-intensive process prevented him from pricing his work to sell. Clay knew he had a unique idea and that there was a market for his original, elegant work, but needed help turning his art practice into a sustainable art business. Jump/Start is a business accelerator program developed by Generator in collaboration with LaunchVT. The 11-week program consists of weekly lectures on topics ranging from accounting, to intellectual property protection, to marketing. The program also facilitates in-depth tutoring with business professionals and mentors. 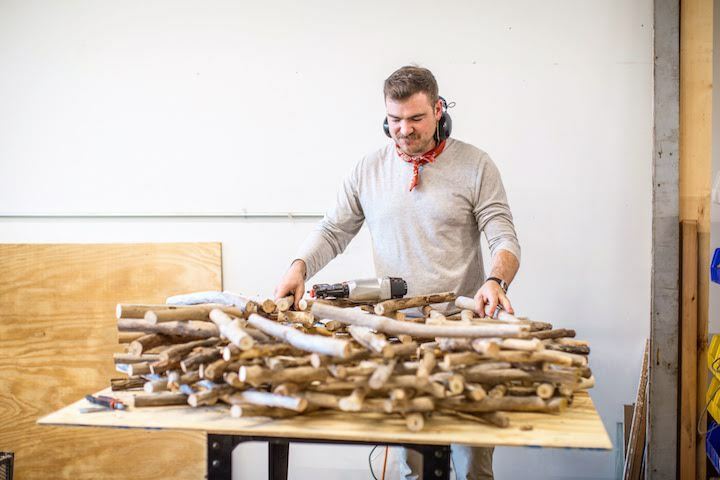 Clay and three other talented makers were given the use of free studio space, 24/7 access to Generator, a stipend, and free tool training classes to help them refine their product prototype. Through the Jump/Start program, Clay received support in developing a foundation for his business, including bookkeeping, branding, pricing, scheduling, and more. He received personal mentoring from Burlington’s lighting legend, Steve Conant. Clay also met with manufacturing experts M&E Design to improve his production process. Clay cited Generator’s network of makers, entrepreneurs, and business professionals as a huge asset to his business. At the conclusion of the Jump/Start program, Clay became a Generator studio member. Clay cites his participation in Jump/Start as the source of his confidence to launch his business, Clay Mohr Lighting. and most recently, a winning bid for a light installation at Stowe’s Spruce Lodge for their Festival of Lights. Clay built and installed his largest piece yet — four feet in diameter. The piece was built in Generator’s common space. “My business is continuing to evolve. With your support, we can help more people like Clay access opportunities to learn, create, and launch themselves and their businesses at Generator. Will you make a year-end gift to support innovation?